What is social learning and how can it help develop a culture of learning? Social learning is a theory by psychologist Albert Bandura that suggests learning is a cognitive process that takes place in a social context and can occur purely through observation or direct instruction, even in the absence of motor reproduction or direct reinforcement. 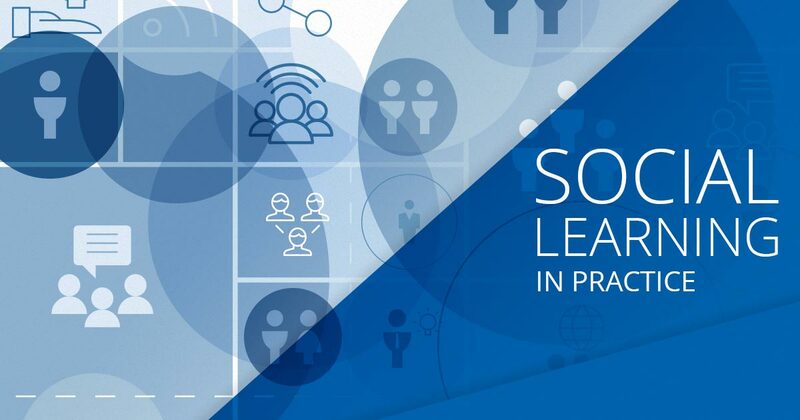 Social learning is the 20% within the 70+20+10 learning model. Academic jargon aside, what does this mean? Let’s take a closer look. Basically, Bandura’s theory is that human beings can learn by example. A simple analogy is a child watching another child touch a hot stove and burn their hand. The observing child only needs to see the impact of the behavior – a burnt hand – to understand the repercussions of mimicking that behavior. The child doesn’t need to touch the stove themselves to know it is hot and will burn their hand. This is social learning at its core. Why does social learning matter? You’ve probably seen the forgetting curve infographic that states most people only recall 10% of information learned within just 72 hours in typical training environments. In practice, this curve means a salesperson will have trouble recalling any lessons from the annual sales kickoff event by the next week. Social learning can reverse this curve. In fact, research shows retention rates as high as 70% when social learning approaches are employed. Rather than relying on typical training environments with low recollection rates, social learning allows learning to happen in the working environment. Learners can pull knowledge from experts within the organization rather than have it pushed on them. Learning becomes a part of the organization culture. Utilizing a social learning method can increase retention while decreasing cost. Well-trained employees perform better and turnover rates decrease. Creating a simple forum in which employees can pose questions and receive answers from within the organization is a simple way to promote a social culture of collaborative learning. An interorganizational wikipedia can be a great source of knowledge for new employees or those unfamiliar with every aspect of an organization. Experts can edit Wiki content as necessary to ensure the information is always relevant. Users can pull information at the point of need. You have people in your organization with questions and qualified experts with answers. Now you simply need a tool to connect them. Create communications channels where experts can use their knowledge to help others. Other users and experts can rate answers to ensure only the best answers are used. You can’t force people to learn but you can give them the right tools and incentives to make sure they don’t waste opportunities. Gamification and rewards can help create these incentives. Gamification can provide a way for administrators and users to track their learning progress. Well-performing users and experts who regularly offer their knowledge can be rewarded to incentivize participation. Social learning isn’t just another way of delivering the same material, it’s a shift in culture within an organization. Learning and development can be transformed from an necessary evil to an opportunity for personal growth with social learning. Try Docebo free for 14 days and discover how your team can benefit from a strategy that incorporates social learning into everyday work.